As we wrap up week two of the Jordan XX8 Days Of Flight, we take look back at the Air Jordan XIV. "The Air Jordan XIV was lower-cut and aerodynamic. With dual Zoom Air and mesh vents, the XIV takes cues from MJ’s passion for Italian sports cars to create a fine-tuned machine on the court. Bust out your ‘fourteens’ for Day 14 of XX8 Days Of Flight. 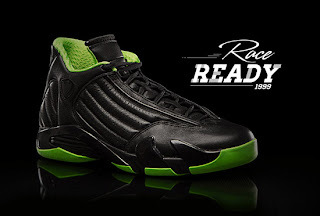 www.AJXX8.com"
The Air Jordan 14 Retro was released for the first time in 2005 and into 2006. After that, we saw them return in 2008, 2011 and 2012. To date, we have seen a few original colorways get retroed however a few coveted pairs have not such as the "Oxidized Green" and "Indiglo" colorways. Also, none of the original low top colorways have been retroed either. 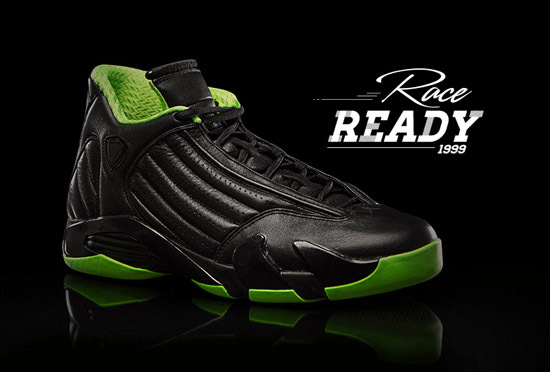 While no Air Jordan 14 Retros are scheduled to be released in 2013 at this time, that doesn't mean we have seen the last of the Air Jordan XIV. If they do get confirmed to return, I will be sure to update everyone. For now, enjoy the images below of this sample black and volt green colorway of the Air Jordan XIV made exclusively to celebrate the Jordan XX8 Days Of Flight Collection. Be sure to check out my Twitter @ajordanxi and Instagram @ajordanxi as I have submitted pictures of some of my Air Jordan XIV collection to share with everyone. You can also see them on the ajordanxi.com official Facebook page here as well.